"From the beginning to the end, I was impressed with..."
Even in a room with glass doors and large windows, it is still difficult to get natural daylight inside a room. This homeowner wanted to be able to use natural light in their living area rather than artificial lighting via lamps and overhead lights. A Solatube was installed in the right corner of the room and allows that natural daylight to shine into the room, keeping it bright and lively. This homeowner in Myrtle Beach, SC was experiencing uncomfortable rooms in both winter and summer caused by their poorly insulated attic. Poorly insulated attics can have numerous effects on the efficiency of your home, resulting in high energy bills and drafty and hot/cold rooms. 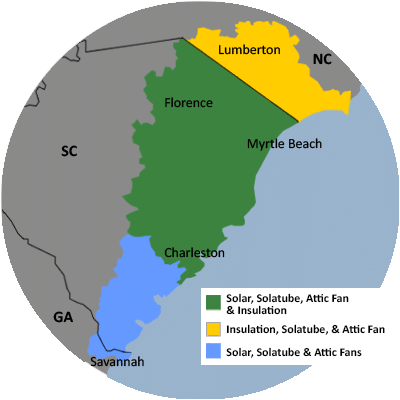 For a FREE no-obligation estimate in Myrtle Beach, SC, please fill out the form to the right and Carolina Energy Conservation will contact you shortly. Hello, I am looking to install solar panels and possibly batteries on my home to save money and help the re-sale value. I would like to have Fiberglass insulation sprayed in my attic over top the existing cellulose insulation I would also like to have solar powered attic fans installed (2). I would recommend CEC for anyone interested in a quality insulation job. Please note; one of the crew member Nico is not on your list. Please kindly give the no. 5 best review. Michael F. Carolina Farms Blvd. Great easy experience, I would highly recommend. Jeff is very knowledgeable and friendly. Price is fair. Rebate from Santee Cooper makes it better yet. We specialize in a variety of energy conservation services not only aimed to lessen your home's carbon footprint and save energy, but help put money back in your pocket by lowering you energy bills each month! Some of the more popular methods we use to reduce your home's energy consumption include various renewable energy sources such as solar panels, and solar attic fans. Other energy conservation tactics we use are LED lighting, Solatube Daylight systems, and much more. Looking to experience additional comfort and energy savings in your home? Carolina Energy Conservation can provide you with a home energy audit to discover what work needs to be done. We offer these services to residents of Myrtle Beach and nearby. We perform a home energy audit before we make any recommendations about improving insulation and air sealing. Once the evaluation is complete, we take the time to sit down with you to discuss the results and help you make the best decisions for you home and family. These solar panels really upgraded the way this home looked before installation. Adding solar panels can also increase the value of your home. These panels are made up of individual cells that have a solid copper foundation on the back, providing protection and power to the cell. The attic over the garage is not insulated,also the garage walls.I want warmer in winter & cooler in summer & lower energy bills.Iam taking bids. We are interested in going solar. Damp crawl space. Standing water.